It's fall in Japan. And like every fall, rice is harvested, leaving behind straw to be hung and dried. 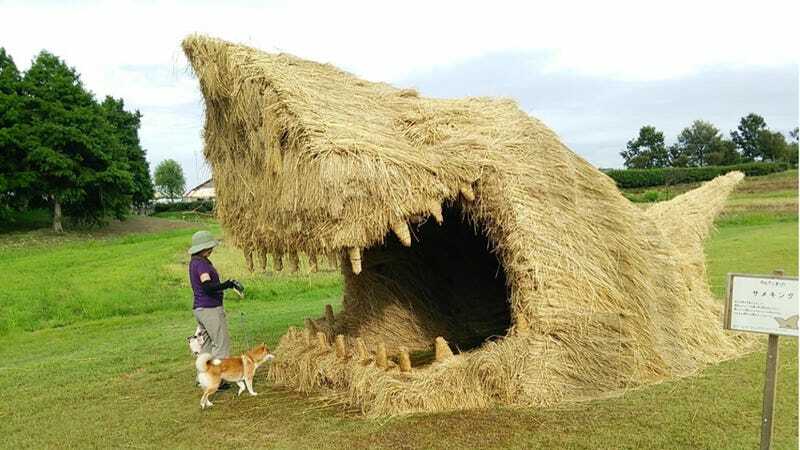 In some rural areas, though, the rice straw has a special use: Making giant beasts. Kagawa Prefecture and Niigata Prefecture have the most famous "straw art festivals," which are large straw sculpture displays. Traditionally, straw was used to thatch roofs. In much the same manner, these straw sculptures are thatched around wooden frames. But instead of roofs, enormous dinosaurs, bugs, and much, much more are created. The rice straw sculptures sure make a nice seasonal bookend with Japan's rice paddy art. To contact the author of this post, write to bashcraftATkotaku.com or find him on Twitter @Brian_Ashcraft.